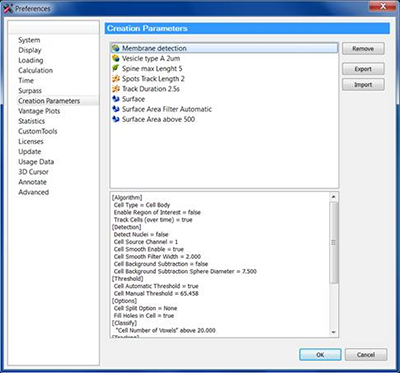 Once a creation Wizard has run its course and desired objects are created, all creation parameters used in the process are listed under the Creation tab. Here you can find two buttons - Rebuild and Remember parameters. 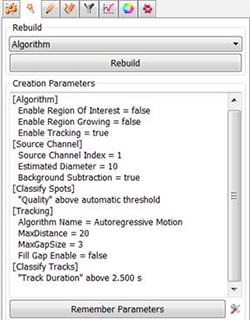 To find out more about the Rebuild button, please refer to “How to use the rebuild function” section. The other button - Remember parameters, allows you to save the creation parameters for future use on another dataset. These saved parameters can then be loaded and re-used on any new data set should you wish to perform an identical analysis sequence. This option is also useful for sharing the parameters with other users to allow them to perform the same analysis on their own datasets. To save the creation parameters, click on the Remember Parameters Button. In the Remember Creation Parameter window, specify a name for the Creation Parameter set. Load Parameters option at the initial step of the Spots, Surfaces, Cells and Filaments creation wizard. The Creation Parameters list mentioned in 1. could be directly accessed by clicking on the Preferences symbol on the Creation tab. This list shows all sets of saved creation parameters. Each one is labelled with an object symbol indicating the type of objects associated with given set of parameters. By clicking on the set name, the entire list of operations, processing instructions and the parameters’ values can be inspected. The Remove, Export and Import buttons let you manage all the various saved parameter sets. Remove button deletes the selected set of creation parameters from the list. The Export and Import buttons provide an easy way to exchange the creation parameters between different users or groups. Select the creation parameters you would like export and click the Export button. If necessary, change the name and save the file in the chosen location. By clicking the Import button, the creation parameters files generated by the Export command can be imported into Imaris. Newly imported set of parameters will be automatically added to the list. At the initial step of the Spots, Surfaces, Cells and Filaments creation wizard the Load Parameter option allows you to select parameters settings and analyze any new data with exactly the same settings. Conveniently, only parameter sets that correspond to the chosen object wizard are loaded – in the example below the analysed Cell object will bring up only Membrane detection and Vesicles type A parameter sets from a list excluding e.g. Surface or Filament sets. Load your chosen parameters set by clicking on it and simply run the creation wizard. All the settings and options required to apply identical parameters to the new data set are automatically loaded. The image analysis can be repeated without going in detail through all settings and associated options. 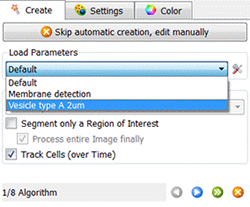 The option to load parameters is only available if a set of parameters has previously been saved under the Creation tab using the Remember Parameters button.